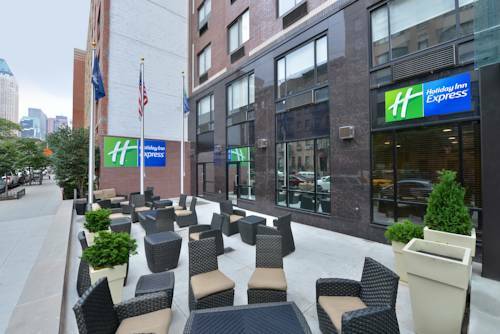 It is our pleasure to welcome you to the Holiday Inn Express Manhattan Midtown West. We strive to provide you with a clean and comfortable room with friendly attentive service while you are away from home. Situated in Midtown West, the hotel is a nearby neighbor to many companies, offering easy access to IBM, Ford, General Motors, FedEx, UPS, Ogilvy & Mathers (WPP). Corporate rate programs are available for many companies which are eligible to earn IHG Rewards Club points. A 24-hour Business Center is available for your convenience. We are located near some of Manhattans most unique attractions such as Hells Kitchen, the Hudson River, Chelsea Piers, Manhattan Cruise Terminal, Intrepid Sea Air and Space Museum, Times Square, Theater District and many more. If that is not enough, our team is wholeheartedly committed in offering a diverse array of amenities to make our guests experience truly enjoyable. Our friendly staff is pleased to be of service and offer recommendations on superb restaurants, lounges, nightlife activities, high-end galleries, and shops all within either a walking distance of the hotel or a quick subway or bus ride away. Start your day with complimentary Express Start breakfast. Pamper yourself in our fully equipped 24-hour fitness center. Take advantage of our complimentary hi-speed wireless Internet while you are relaxing on the outdoor patio. We want you to enjoy every day of your stay, so we pledge to your our service guarantee. Located in NYC's busiest district, Grand Central connects the major MTA subway lines in one terminal, as well as the Metro-North lines. Also known for its dining concourse and the surpluss of food, restaurants, and seating areas below the Main Concourse. Yearly outdoor driving range. Hit full shots, practice putting and take lessons from top golf pros. Located on the Hudson River, this four-tiered "super-range" features a 200-yard fairway, a full-service teaching academy, & Full Swing simulators.